Today I´ve wanted to dress colorful, following the color blocking trend, I hope you like it! by the way, thank you very much to my new followers, and people who take a minute to leave a comment or critique! I love it! You're so gorgeous! Lovely pants! the colour is beautiful! Hi, my name is Anita. Your blog pictures are very beautiful and I enjoy reading it very much. It’s awesome! I just subscribed your blog so I can read your posts all the time. For me, I love fashion too! I write my blog everyday. And if you have time, come to see my blog and talk there… Thanks. love your outfit , u look gorgeous and fancy ! you really pulled it off!! Cool pics and lovely bag! Genial la combinación de colores!! 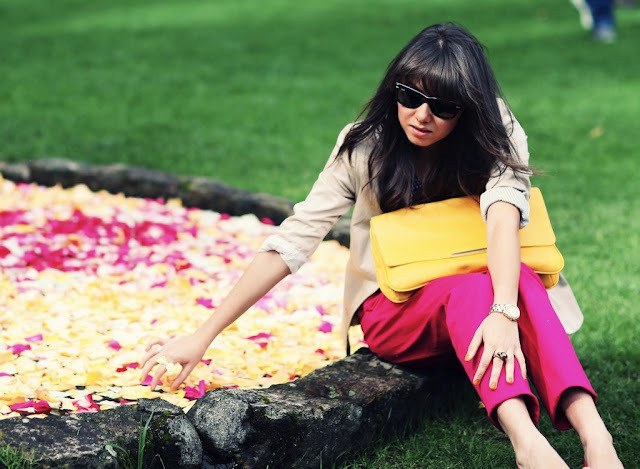 so adorable outfit, love yellow pochette!!! //www.fashion-ice.blogspot.com <Don't forget to enter the give-away! lust lust lusting this outfit!! Great blog :) Following you! Amazing blog!!! follow you in bloglovin!!! Beautiful outfit, You look so pretty!!! You look so pretty! the colors are amazing! loving the pink+yellow combo! what camera do you use? the pics are gorgeous! My Camera is a Canon 5d mark ii with a canon ef 50 mm f1.8! I will visit your blog for sure! Hi Juliana! Congratulations for your participation in "I Challenge you to..." You looks amazing!! Cool combination of colours!! Do you speak spanish? Xoxo from Spain!! Hola Noemi, siii hablo perfecto español, lo que quieras preguntar o comentar sin duda lo puedes hacer en tu idioma!